This article is about the feast celebrating the baptism of Christ. For other uses, see Baptism of Jesus (disambiguation). Baptism of Christ fresco by Giotto di Bondone, c. 1305 (Cappella Scrovegni, Padua, Italy). The Baptism of the Christ (or the Baptism of Christ) is the feast day commemorating the baptism of Jesus in the Jordan River by John the Baptist. Originally the baptism of Christ was celebrated on Epiphany, which commemorates the coming of the Magi, the baptism of Christ, and the wedding at Cana. Over time in the West, however, the celebration of the baptism of the Lord came to be commemorated as a distinct feast from Epiphany. It is celebrated in Anglican and Lutheran Churches on the first Sunday following The Epiphany of Our Lord (6 January). In the Eastern Orthodox and the Eastern Catholic Churches, the Baptism of the Lord is celebrated as an integral part of the celebration on 6 January, the Great Feast of the Theophany. For those churches which follow the traditional Julian Calendar, 6 January falls on 19 January of the modern Gregorian Calendar (see Epiphany (holiday) and Theophany for details). The Baptism of the Lord is observed as a distinct feast in the Roman rite, although it was originally one of three Gospel events marked by the feast of the Epiphany. Long after the visit of the Magi had in the West overshadowed the other elements commemorated in the Epiphany, Pope Pius XII instituted in 1955 a separate liturgical commemoration of the Baptism. 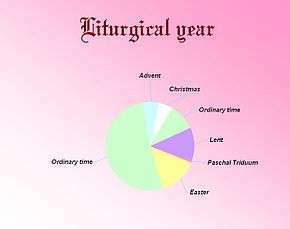 In fact, the Tridentine Calendar has no feast of the Baptism of the Lord. It was almost four centuries later that the feast was instituted, under the denomination "Commemoration of the Baptism of our Lord", for celebration on 13 January as a major double, using for the Office and the Mass those previously said on the Octave of the Epiphany, which Pius XII abolished; but if the Commemoration of the Baptism of Our Lord occurred on Sunday, the Office and Mass were to be those of the Feast of the Holy Family without any commemoration. In his revision of the calendar five years later, Pope John XXIII kept on 13 January the "Commemoration of the Baptism of our Lord Jesus Christ", with the rank of a second-class feast. A mere 14 years after the institution of the feast, Pope Paul VI set its date as the first Sunday after 6 January or, if in a particular country the Epiphany is celebrated on 7 or 8 January, on the following Monday. Pope John Paul II initiated a custom whereby on this feast the Pope baptizes babies in the Sistine Chapel. The feast marks the end of the liturgical season of Christmastide. On the following day the season of ordinary time begins. In the Church of England, Epiphany may be observed on 6 January proper, or on the Sunday between 2 and 8 January. If Epiphany is observed on a Sunday on 6 January or before, the Baptism of Christ is observed on the following Sunday. If the Epiphany is observed on 7 or 8 January, the Baptism of Christ is observed on the following Monday. In the Church of England, Ordinary Time does not begin until the day after the Presentation of Christ in the Temple. In the Episcopal Church [USA], Epiphany is always celebrated on January 6, and the Baptism of the Lord is always celebrated on the following Sunday. It is not clear as to whether or not the Feast of the Baptism of our Lord is the end of Christmastide for the Episcopal Church. On one hand, the Prayer Book refers to the "Twelve Days of Christmas," and clearly distinguishes the Christmas and Epiphany seasons, the latter extending until Ash Wednesday. On the other hand, the Prayer Book allows for the continued use of Christmas prayers and readings on the weekdays following the Epiphany and leading up to the Baptism of our Lord. Further, the Epiphany and the Baptism of Christ are viewed as specially connected, allowing the interpretation that Christmastide does extend through and end with the Feast of our Lord's Baptism on the Sunday following the Epiphany.